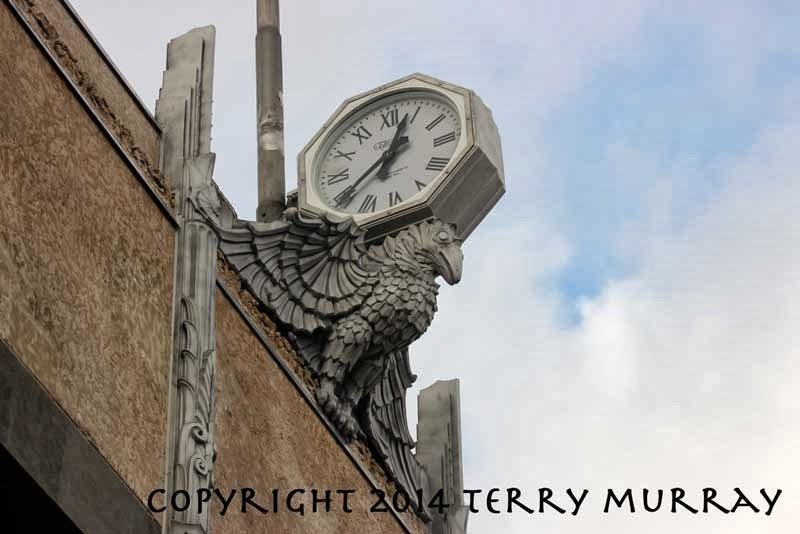 Over the Christmas holidays, I was driving past the old Consumers Gas Showroom, on Yonge Street north of Eglinton in Toronto and happened to glance up at the clock. The clock that hasn’t worked — at least, not for long — for at least the last 20 years. Well, what to my wondering eyes should appear, but a cleaned-up, lit-up, working clock! 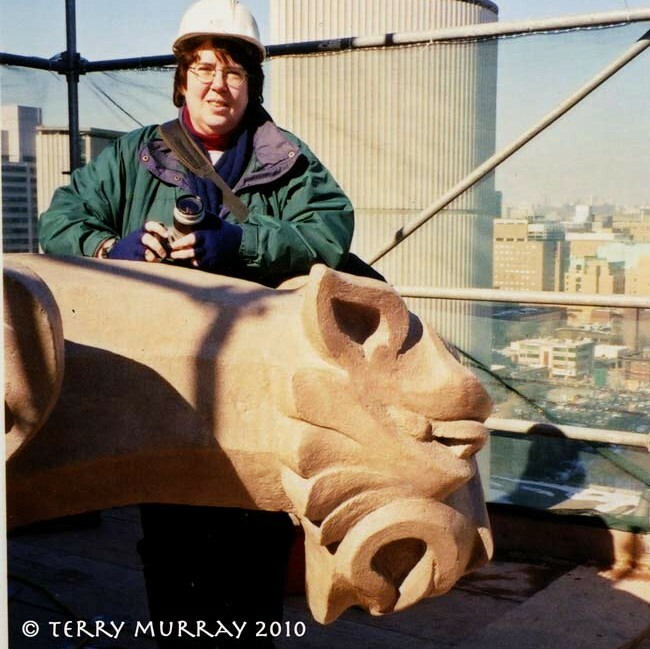 I guessed — correctly — that the work on the clock had been done by Abernethy and Son, the Richmond Hill-based firm of watch and clockmakers and heritage clock restorers. I called to find out about the Consumers Gas clock, and found out it was Phil Abernethy (the eponymous “Son“) who handled the job. He told me that the original Telechron system was worn out and couldn’t be restored. So he installed a main synchronous motor, an AC motor that is synchronized with the frequency of the supply current. If the power supply is interrupted, the clock shuts off for 12 hours, at which time (assuming the hydro has been restored) it begins telling the correct time again. It even has an automatic Daylight Saving Time correction. “The system is virtually hands-off,” Phil said. 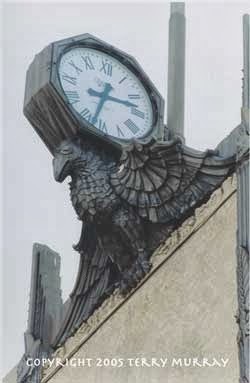 The clock’s case and the bird on whose back it is borne are made of cast aluminum which was sandblasted, changing the colour from near-black (as in the picture below, from 2005) to a dull grey. Because it’s difficult to apply a finish to aluminum, that’s just the naked metal exposed to the elements, meaning it will acquire a darker patina in time, he said. The southern-exposed clock face — milk glass that is 24 in. (or about 61 cm.) in diameter — was cracked, but that could be repaired without Phil having to reproduce it in acrylic. It’s great to have the clock working again, and so beautifully. 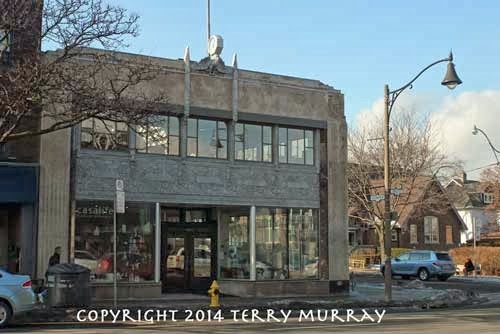 It actually was important to the North Toronto community in 1931 when architect Charles Dolphin built the Consumers Gas Showroom. “A feature required on the building was a clock,” according to a report in the building journal Construction in 1931. “As there was none in the immediate district it was felt that this would be a very useful as well as attractive item if it could be embodied in the design. Dolphin accomplished that by placing the clock on “an allegorical design of a bird,” frozen as it was poised for flight to the east, thus allowing people on Yonge Street to see the time. 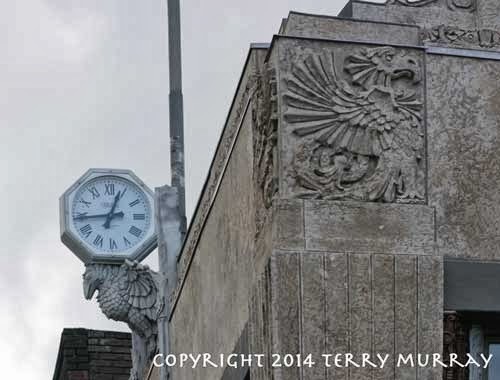 The bird motif was repeated in stone at the corners of the building, atop fluted pilasters. The birds most resemble the phoenix, the legendary bird that is said to have lived 500 years, burned itself on a pyre, and risen from the ashes to live again. Only missing on this building are the flames that usually accompany representations of the phoenix — unless they were assumed, or the choice of bird was emblematic or a visual joke (Consumers Gas — get it?). In recent years, the Consumers Gas Showroom building also been a women’s fitness centre, a Puma athletic shoe store, Bowerings, the Children’s Book Store, and a YWCA. Its latest incarnation is as Casalife, a furniture store that opened in early December, and for which the clock was restored. Nice job, Phil!